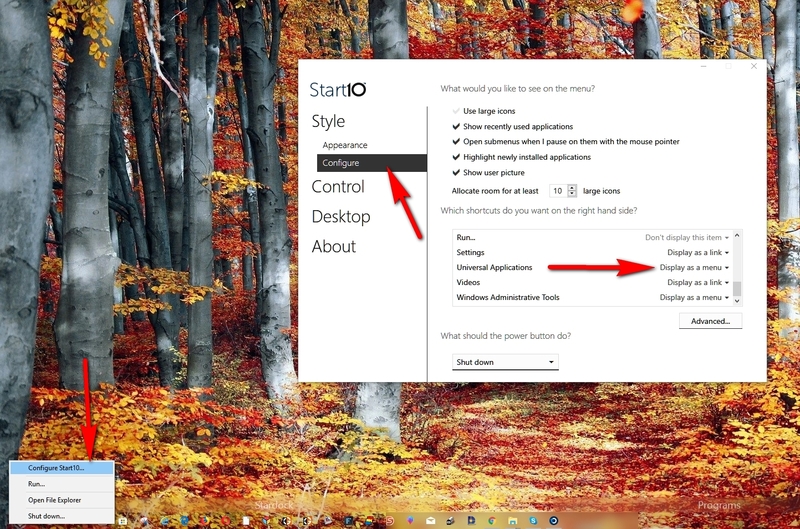 Is there a way to do this in Start 10 with a Win 10 (modern) look? 2) Are there more "background" skins to download for Start10? I would like to have more variations to choose from. P.S Is there a way to post an image directly? you'll get Fly-outs ( not Cascade ) but Fly Outs . You mean that Cascading Menus cannot be enabled? If so, I'm completely surprised. If Classic Shell can do it, (as above image link) why not Start10? Also, are there more "background" skins to download for Start10? P.S. I still think that Stardock is a great company! and scroll through or pick a custom image . Or download WindowBlinds you like with a different Start Menu design. However, what about the question regarding Cascading Menus for Start10? Is there a tweak within the program? Not at this time . However I will submit your request to be considered if a future update. I'm really surprised. I was going to buy 5 licenses. Yes, please submit that request. I can't be the only one. It would be great if a Stardock Employee can chime in on this. So I have been watching but would like to know if Cascading Menus for Start10 will be a reality. Perhaps in the next build?